If you like tea and need a t-shirt then you should check out this tea shirt. The women’s t-shirt is available in white, black, and light gray and comes in women’s sizes Small – 2XL and it is made from 95% cotton and 5% spandex. 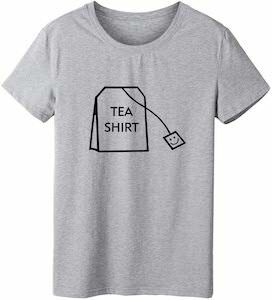 On the t-shirt you can see a big tea bag and on the tea bag it says “Tea Shirt” so that people know that this is the t-shirt for you to wear when you are drinking tea and if you like tea so much you will always be wearing this fun t-shirt. If you like tea then this is the t-shirt you want as it shows a tea pot while pouring a cup of tea. it’s just a fun t-shirt that comes in many colors and in styles for men and women. On the t-shirt you can find a blue teapot with tea pouring out into the yellow and pink tea cup. Wearing this t-shirt at tea time or just when ever and you will feel like more tea for sure. You can get this tea t-shirt in men and women’s sizes Small – 6XL and all are made from 100% cotton. 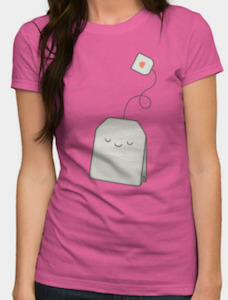 This t-shirt is all about your love of tea as on the t-shirt you can see a happy tea bag ready to be put in a pot of hot water to make you favorite drink tea of course. 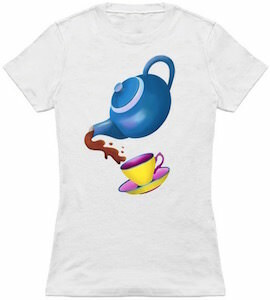 You can get this tea time t-shirt in styles for men, women and kids and this adorable t-shirt is available in many fun colors and sizes so that you get the tea bag t-shirt you want. The tea bag on the t-shirt is grey with a happy looking face on it that is ready for a hot water bath and on the end of the string you find the label with on it a red heart just because tea is love. 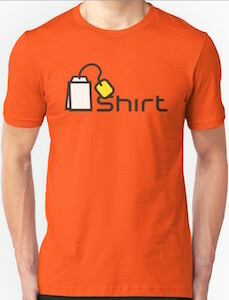 If you like t-shirt’s and tea then this is the shirt you want to see. On the shirt you can see a tea bag with next to it the word “Shirt” and together that of course means” Tea Shirt” witch is almost the same as t-shirt. You can get the tea shirt in many fun colors and in men and women’s styles in sizes ranging from XSmall – 3XL. If you like to be funny and drink tea then a t-shirt as amazing like this could be just what you need to brighten up some people’s day.